RITE of ILK is a local co-operative exploration game that revolves around the lives of two sacrificed children who are forced to venture through unknown lands to save their tribe from the edge of extinction. All while being tied together by a rope. The two must trek through treacherous environments, solve environmental puzzles, and return peace to their home. The game is developed by Turtleneck Studios. Turtleneck Studios was present at Gamescom 2017, showcasing their game, Rite of Ilk at the Indie Arena Booth and we managed to get some hands-on time with the game as well as chat with Alanay Cekic. Turtleneck Studios is two and a half years old with its members coming from other jobs with a lot of experience (in companies such as Guerrilla Games for example). Alanay explained that the main goal of the studio is to basically bring the AAA game feeling to the indie games industry through what they will be creating. “My girlfriend does not play many games and so she is not that experienced in them. Our goal was try and make a game that would let people like that, actually enjoy the game and get into,” explained Alanay after we had our go on the co-operative game. Alanay explained to us that the game is heavily inspired by titles like A Tale of Two Sons and Shadow of the Colossus. “We are trying to figure out the implementation of online play at the moment,” said Alany, while explaining the studio’s desire to add online play to Rite of Ilk, so that friends and strangers can enjoy it together from afar. 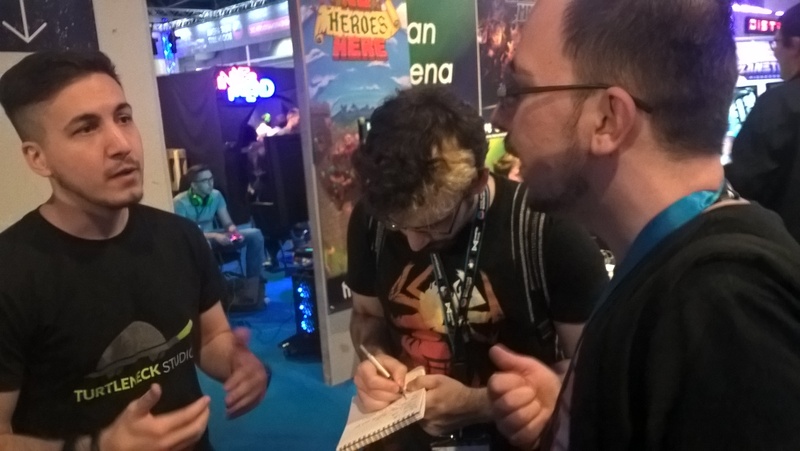 We also asked him what he believed one of the biggest challenges in developing the game was and he told us that the rope part is most definitely difficult to get to work right. “You want people to work together and you also need to make things noticeable,” said Alanay, explaining why that part of the game’s development was tricky. If you want to learn more about the game, you can check out its Twitter and Facebook pages, as well as its website.